We are leading manufacturer, wholesaler and exporter of Snap Ring. A cir-clip (a combination of 'circle' and 'clip', and pronounced thus), or snap ring is a type of fastener consisting of a semi-flexible metal ring with open ends which can be snapped into place, into a machined groove on a dowel pin or other part to permit rotation but to prevent lateral movement. There are two basic types: internal and external, referring to whether they are fitted into a tube or over a shaft. Cir-clips are often used to secure pinned connections. Cir-clips which are fitted may be removed with a pair of needle-nosed pliers or a special snap ring tool if the cir-clip is designed to include entry points for the pliers or tool. Alternatively, cautious leverage with a flat-headed screwdriver may be necessary in lieu of the correct tools or design of snap-ring. T (Thickness): This parameter describes the Thickness of Sheet Or Strips. W (Width): This parameter describes the Width of Sheet or Strips. 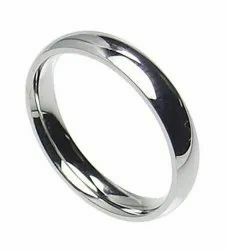 H (Height ): Height of Snap Ring. We are dedicatedly engaged in offering a commendable range of SS Ring. The offered ring is widely used to secure pinned connections. Using high-grade material with the help of innovative technology, the provided ring is manufactured under the guidance of dexterous professionals at our technically sound manufacturing unit. Owing to its unique features such as durability, easy installation and accurate dimension, the offered ring is highly acclaimed by our renowned customers. Looking for Snap Ring ?